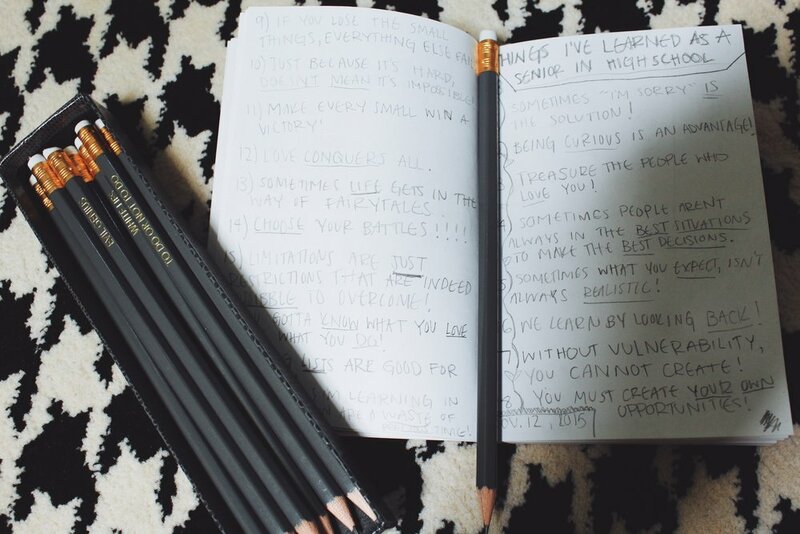 A while back in early November, I began to write down some life lessons & friendly reminders I had run into throughout my senior year of high school. Some I would hear sitting in english class from my teacher, others I would realize while in a fight with a friend or my boyfriend, but all I found are things I want to remember now & for the rest of my life. Maybe majority of these resonate with you, or maybe just a few grab your attention, but I hope they can help you through situations now or even in the future. And remember, life is about learning, appreciate the process. Sometimes "I'm sorry" is the solution. Being curious is an advantage! Sometimes people aren't always in the best situations to make the best decisions. Sometimes what you expect, may not be realistic. That's okay. We learn the most by lookingback. You must create your own opportunities. They won't always come to you. If you lose the small things, everything else fails. Journey not the destination. Just because it's hard, doesn't mean it's impossible. Make every small win a victory. Journey not destination. Love conquers all. Every time. Sometimes lifewill get in the way of your fairytales. Accept that. C H O O S E. Y O U R. B A T T L E S.
You have to know what you love to love what you do. Making lists are good for planning. And relieving stress. The things you learn in the second semester will be a waste of your time. But remember you need them to graduate. When you get the overwhelming urge to create, create. Stop what you're doing and create. Keep your eyes on the woman you want to be. Do not, I repeat, do not make time for people who do not make time for you. We tend to not appreciate a great thing because we miss another thing & then miss that great thing because we didn't appreciate it in the moment. Be present. You control your mind, so don't let it control you. See as many things as you can, go to as many things as you can go to. You will regret the things you don't try, not the things that you do.